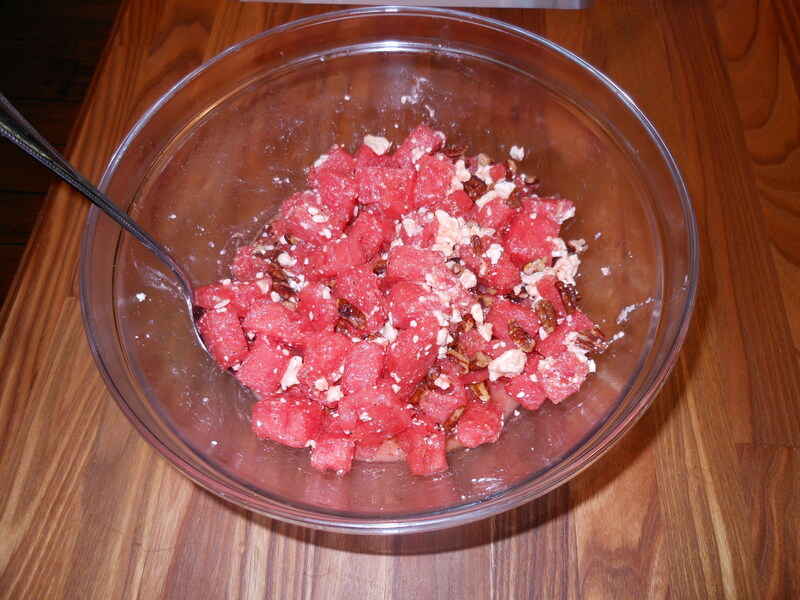 Place the melon pieces in a large bowl. In another small bowl, whisk together the lime juice, oil, sugar, salt and pepper. Pour dressing over melon. Toss gently to coat. Add the feta, nuts, and cilantro (if you’re using) and toss to blend. I usually let it sit for at least an hour to blend flavors together in fridge. Take out half an hour or so before so that the cheese is room temperature. Of course, this would be delish with some heirloom tomatoes or some seedless Kirby cukes added. Take out a little watermelon if you’re including cukes and tomatoes (take watermelon down to 2 lbs. and substitute for 1 lb. of tomatoes and cukes.) You can use chopped up mint leaves instead of cilantro and you can substitute the nuts for peanuts, cashews, pignoli or pecans. I like pecans and pignolis best. You can also choose to leave the nuts out entirely.